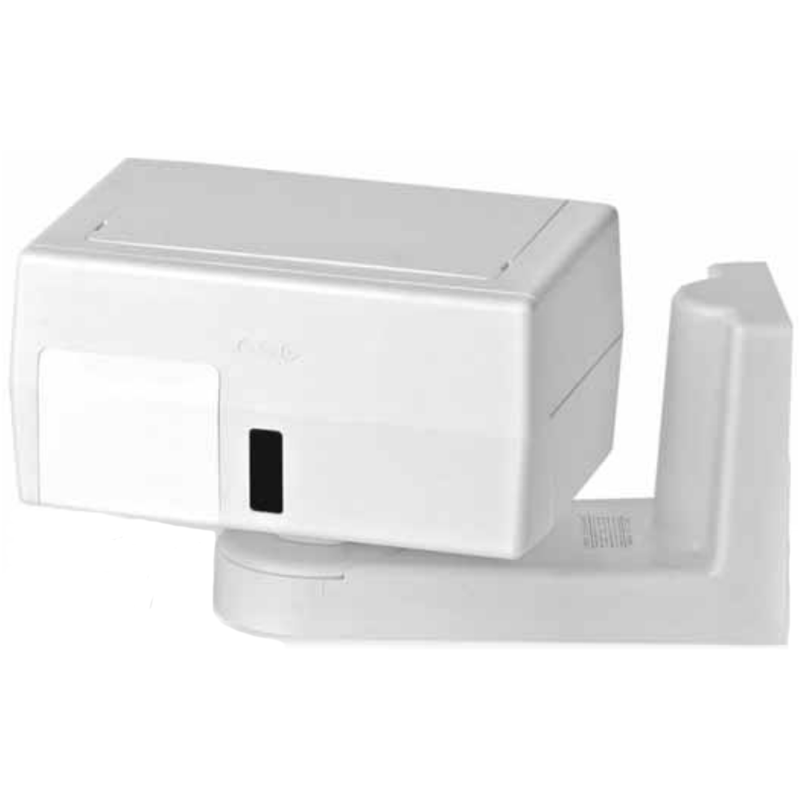 The Honeywell DT906 is a hardwired DUAL-TEC motion detector protects with anti-mask. The DT906 uses two technologies microwave and PIR. It is vandal-resistant housing, detects large coverage patterns and has three microcontroller-based sensitivity modes, that make the powerful DT906 DUAL TEC sensors ideal for the harshest commercial and industrial environments. The Normal Anti-Mask Condition uses Active Infrared (AIR) technology to detect masking. The sensor signals a mask condition when a variety of materials and reflective objects are placed within 2 inches (50mm) in front of the sensor. When most masking materials or objects are removed, the anti-mask condition will be cleared after several seconds. When the cause of the anti-mask condition is any type of spray or paint coating applied to the window, the window must be replaced before the anti-mask condition can be cleared. After replacing the window, perform a walk test on the sensor. The DT906 is a DUAL-TEC hardwired motion detector that offers X-Band technology and a trouble-free, out of the box emperience to simply the installation process and reduce time. With the passive infrared DT906 optimum performance is achieved using custom developed extended range Fresnel optics, look down, cover and wall tamper, and selectable pet immunity. Leading edge sensing technologies and a wide range of models to suit the requirements of most applications, the Honeywell DT906 motion detector will maximize intruder detection while diminishing false alarms. Microcontroller-Based Dual Technology: Microwave and passive infrared (PIR) technologies, combined with microcontroller-based advanced signal processing, provide excellent detection while virtually eliminating false alarms and costly service calls. Sensor Sabotage Prevention: The DT906 uses Active Infrared for anti-masking to detect attempts to mask the sensor. The patented look-down lens catches saboteurs who try to disable the unit from below, while three different tamper switches deter would-be criminals from physically damaging the sensor. The patented INFORMER® function, designed primarily as a diagnostic tool, monitors for sensor blockage and can help identify a sabotage situation. Queue Logic Event Processing: The microcontroller in the DT906 converts all incoming microwave and PIR signals from analog-to-digital format. If the signal is determined to be valid it enters the Queue Logic Event Process. This process stores the valid signals within a moving window of time, keeping up to eight events for each signal type. Based on the First In First Out (FIFO) concept, Queue Logic requires a sophisticated on-board microcontroller to make advanced calculations for qualifying a sequence of events as an actual alarm. Designed for Harsh Environments: Vandal resistant housing combined with a zero clearance bug guard make the DT-906 ideal for commercial and industrial applications such as warehouses, large retail facilities, manufacturing sites and schools. Self-Adjusting Thresholds: The on-board microcontroller automatically adjusts the microwave and PIR thresholds to compensate for environmental disturbances not related to actual intrusion events. True temperature compensation continually optimizes the performance of the PIR to account for changes in room temperature. Environmental noise compensation keeps common environmental disturbances such as fluorescent lights from causing the microwave to false alarm. Digital Fluorescent Light Filter: Digital filter virtually eliminates interference caused by fluorescent lighting. Three Microcontroller-based Sensitivity Modes: Sensor sensitivity can be set to high for fastest capture, to normal, or to low for maximum false alarm immunity in harsh environments. Zero Clearance Bug Guard: The bug guard provides zero clearance, protecting the pyro chamber from insects that can cause false alarms. Small Animal Immunity: Immune to small animals commonly found in commercial conditions (birds, rodents, snakes). DIYer-Friendly Design: Designed with the DIYer in mind, the DT906 contains a large wiring space, protective clear plastic covers over the circuit boards to prevent damage, two end-of-line terminals, flashed over LEDs visible at great distance, a fast-install wall mounting plate for the included swivel mounting bracket, and easy vertical and horizontal adjustment. Mirror Optics For Long Range: The DT906 utilizes custom designed mirror optics to provide effective capture at long range. Each model is easily selectable between two ranges. LED Diagnostics: The LEDs will display codes to indicate an anti-masking condition, INFORMER condition, trouble condition, and recallable codes to indicate INFORMER results and whether or not there was a self-test failure. Advanced Commercial/Industrial Features: In addition to anti-masking (DT906), the detector has command input for initiating a self-test remotely, has CENELEC two wire input options, and has a remote LED enable input.